Biotechnology has always fascinated me for being able to modify the crops for a sustainable agricultural production using foreign genes. 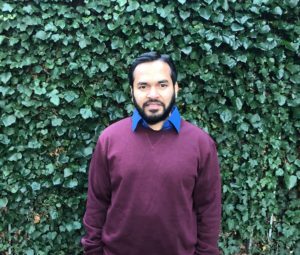 After finishing my major in Molecular Biology and Biotechnology (2013) from University of Peradeniya, Sri Lanka, I started applying for PhD positions in Australia to follow my dream to pursue higher studies in plant science. I was privileged to start my PhD in 2015 in the faculty of Veterinary and Agricultural sciences, The University of Melbourne under the guidance of Professor Dr. Paul Taylor and Associate Professor Dr. Derek Russell on canola biotechnology. Canola, being the second most important oilseed crop in the world and Australia being an important producer, my study focusses on the use of new genes to alleviate abiotic and biotic stresses in canola. 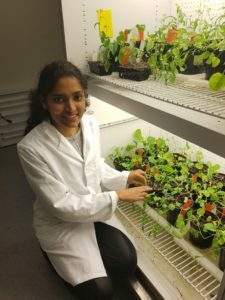 I started developing and optimising the tissue culture based gene transformation of canola using rapid-cycling Brassica napus as the model system and used the developed techniques to introduce traits of interests for farmers such as tolerance to frost and diseases. In 2017, I joined the Australian society for plant scientists (ASPS), a useful society in Australia which helps young scientists to connect, publish and choose career pathways. I was fortunate to win a travel award from ASPS to attend ComBio 2017 held in the convention centre, Adelaide to present some of my research findings. It was a good opportunity to hear from other researchers around the world and to get to know researchers with similar research interests. All plants are subject to diseases caused by different pathogens which can affect food security. Among all these plant pathogens, rust fungi are specialized to different economically important crops such as wheat and barley and can cause substantial crop failure. Due to the increase in human population and emergence of new virulent races of rust pathogen, the identification of new durable sources of resistance is crucial for future crop protection and food security. Therefore, my PhD project involves determination of the genetic and molecular basis of resistance in barley in response to cereal rust pathogens (Puccinia rust pathogens). My work includes resistance gene identification in response to diverse rust pathogens in selected mapping barley populations, subsequent fine mapping analysis with an ultimate aim to discover novel resistance sources in barley that are effective to rust pathogens and can be transferred into other crops. The ASPS travel grant fund enabled me to attend the COMBIO conference 2017 in Adelaide which was a critical juncture for my professional development. This conference was a great opportunity to present my research to a wide range of experts and research groups in plant science. I had the opportunity to present a major component of my PhD project, which enabled me to improve my oral presentation skills, receive feedback and develop network with scholars within the Australian plant scientific community. The improved results based on the presented work has been published in Phytopathology Journal in May 2018. My name is Yoav Yichie and I’m a PhD candidate from The University of Sydney. I am in the third year of my candidature, and I’m focusing on the vast genetic diversity of endemic Australian rice species, particularly O. australiensis and O. meridionalis. In my research I deal with one of the most critical issues related to climate change and land management: soil salinity. Salinity affects a significant proportion of arable land globally, and is particularly detrimental for irrigated agriculture, which provides approximately one-third of the world’s food supply. Millions of hectares are technically suited for rice production but are left uncultivated, or give very low yields, because of soil salinity. 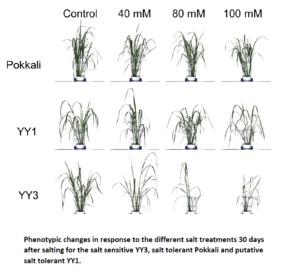 There is now a burgeoning interest in native rice species as a source of abiotic stress tolerance genes; however, to date, no work has been published on their salt tolerance. In my research I use the genetic pool stored in wild relatives of crop species to enrich the genetic diversity and provide improved traits to commercial rice varieties. Last year I presented some of my research findings at COMBIO 2017, Adelaide. I had the opportunity to discuss my research with some of the most well-known researchers in this field. I met many colleagues and expanded my scientific network. I am grateful to have had the opportunity to share my knowledge and obtain feedback and insights from other researchers from around the globe. I was awarded for the Best Phenotyping Poster by the APPF Plant Phenomics. I wish to gratefully acknowledge the APPF committee who awarded me the poster prize. I was granted financial assistance to attend and present this poster at ComBio 2017. In this poster, I highlighted the main results of the salt screening experiments, where I managed to establish a core collection of salt-sensitive and tolerant accessions. Participating in ComBio 2017 was a great experience for me. Firstly, I would like to thank the committee for providing a grant travel that gave me that opportunity. As part of the three-day conference, I attended meetings related to plant development, physiology, technology and abiotic stress. The talks (and the great speakers) enabled me to enrich my knowledge and broaden my understanding of these fields. Moreover, by presenting my poster entitled “High-throughput non-invasive phenotyping reveals salinity tolerance in Australian wild rice species during seedling growth”, I had the chance to obtain feedback and consult with researchers from many disciplines. This experience provided a platform for some useful discussions which will help to strengthen parts of my thesis as well as highlight areas needing further work. I thoroughly enjoyed the conference and think it was a great opportunity for me at this early stage in my career as a researcher. Networking with scientists from diverse backgrounds and interest has reignited my passion and enthusiasm for science and particularly plant genetics research. I would like to thank The Australian Society of Plant Scientists for awarding me the grant which made my attendance possible. I am Chana Borjigin, a 3rd year PhD student from the University of Adelaide. I grew up on a small farm where I always had a close relationship with different cereal crops like maize, rice, wheat and beans. Following my father to inspect the crops on the farm after school brought so much fun to my childhood life. I started my bachelor’s studies in plant sciences (in the specialization of agriculture sciences) in 2006, and never thought to work or study in any other field in the past 12 years as plants to me is like my beloved pets and I like being with them. My PhD research is on understanding sodium tissue tolerance in a bread wheat landrace Mocho de Espiga Branca. 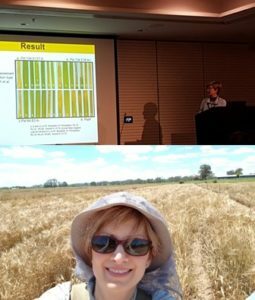 My poster entitled Identification of Novel Loci and Genes for Salinity Tissue Tolerance in a Bread Wheat Landrace Mocho de Espiga Branca was awarded the ASPS Student Poster Prize at the ComBio 2017 held in Adelaide. I am thankful for ASPS Committee for awarding me the prize. It is the first prize I have ever been awarded in my PhD life and is definitely going to be a great encouragement on continuing my research in plant sciences. Participating and presenting at the ComBio 2017 offered me with a great opportunity to present my research work in front of experts and peers in plant sciences to get constructive comments and exchange ideas. By attending the conference, I was also able to build up potential collaborating networks for my current research, and with a couple of scientists we already have started our collaboration on a part of my PhD project. I am grateful for being a member of ASPS and looking forward to meeting with all other members again and update my recent research progress at the ComBio 2018 in Sydney! As recipient of the ASPS travelling fellowship I was given the opportunity to travel to Heidelberg, Germany, famous for its numerous scientific institutes as well as the beautiful scenery. 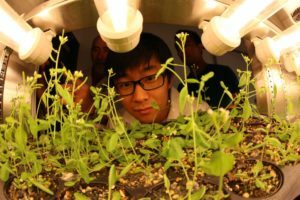 My PhD project in the Gendall lab at La Trobe University involved studying the importance of a class of Na+/H+ exchanger proteins or NHXs in the model plant species Arabidopsis thaliana. These proteins localise to the membrane of various vesicles in the cell which are responsible for the sorting and recycling of cellular cargo proteins. My work in Australia studying these vesicles involved light microscopy studies which are not capable of resolving the structure of these vesicles I am interested in. Through the generous funding of the ASPS I was able to visit the lab of Prof. Karin Schumacher who is one of the leaders in the plant cell biology field, and whose lab has great experience in using electron microscopy to resolve the ultrastructure of these membrane bound vesicles. After learning how to prepare my plant root samples for imaging under the electron microscopy with guidance from Dr. Stefan Hillmer, we were able to obtain strikingly clear images of a type of cellular vesicle called multi-vesicular bodies (see Figure). I am currently analysing these results to determine if the formation or maturation of these vesicles could be disrupted in plant cells which lack particular NHX proteins. I am grateful to the ASPS for providing me the opportunity to learn valuable skills and techniques overseas which I would not be able to achieve in Australia. Transmission electron microscopy image of an enlarged multi-vesicular body (white structure) in an Arabidopsis thaliana root cell. 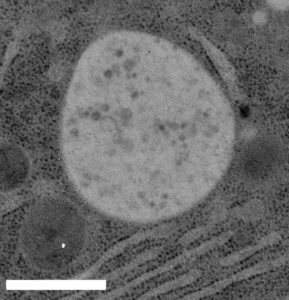 The numerous dark structures contained in the multi-vesicular body are intra-luminal vesicles which contain cargo proteins destined to be degraded. Scale bar = 500nm. ASPS has become affiliated with International Journal of Molecular Sciences (IJMS) and Plants. It will be the ASPS 60th anniversary at ComBio2018 so come and be part of our history. Want to work with the Global Plant Council?We’re hiring a full-time Communications Officer, who will be responsible for managing the GPC’s online presence, relationships with Member Organizations, Affiliates and sponsors, and for performing administrative tasks.If you think you could help the GPC to accomplish its mission to promote collaboration between plant and crop scientists from around the world, please see our job advertisement for more information, and contact Sarah Jose (sarah@globalplantcouncil.org) if you have any questions. Click here for the full job description. Application deadline: 29th JUNE! Here are Chenchen and Mainul writing about ComBio2017. Hope you manage to get your applications in C.O.B. today for ComBio2018. An understanding of the mechanisms which have evolved to allow plants to tolerate drought are crucial to the development of crops which can be productive in adverse climatic conditions. My PhD project focuses on a retrograde signalling pathway, (3’ –phosphoadenosine 5’-phosphate, PAP), which regulates plant stomatal activity and therefore helps plants to tolerate drought. I am looking at this signalling pathway with an evolutionary perspective and trying to understand the mechanism that has evolved as plants conquered the land during evolution, this process can be also regarded as the first development of adaptations to drought. If similar mechanisms can be exploited in crop breeding, higher crop yields can be achieved under unfavourable environmental conditions such as drought. I have used a wide range of techniques in my research including bioinformatics, electro-physiology and genetics. Some of these results were presented on my poster at ComBio-2017. I am grateful that this poster was chosen as the winning student poster by ASPS, and this has also allowed more people to become familiar with my research. ComBio-2017 was an awesome occasion for researchers. It opened my eyes to new and exciting research and also gave me a chance to meet other researchers in my field. During the poster presentation, ideas and knowledge were exchanged and this has helped me to explore further aspects in my project. I am a proud member of ASPS and am looking forward to participating in future conferences. Plants are the most trustworthy friends for mankind. They are equipped with an internal system that can exploit sunlight, water and carbon dioxide being exhaled by humans in order to generate carbohydrate and oxygen which in turn is inhaled by humans. Thus, plants act as primary food producers and play a key role for survival of all other living organisms in the ecosystem. As our global population is rising consistently and expected to reach 9.7 billion from the current 7.3 billion, plant scientists, especially those working with crops face a significant challenge in order to meet this high demand of food and fodder. As different traits such as yield output in plants are regulated by genes, therefore plant scientists are constantly innovating molecular genetics based strategies to tackle this situation. Due to this aspect, I have chosen to pursue a career in plant science. The Australian Society of Plant Scientists (ASPS) is a community which is contributing towards the aforementioned crisis at the national and international level. Scientists of this organization include some of the leading members in their respective fields whose entire life is dedicated towards unveiling solutions for feeding the hungry mouths around the world. 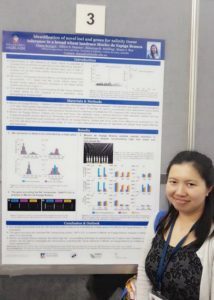 The travel grant offered to me by ASPS for attending Combio 2017 conference at the Adelaide Convention Centre, Adelaide was a significant boost for a young early career scientist like myself because I could present a poster about my PhD research work on flowering time regulation in garden pea which is relevant for yield outcome, and thus received constructive feedbacks from some of the experts in the field. Likewise, I learned the skill of presenting the work of my entire thesis within two minutes by participating in a poster teaser session. Besides, I gained much needed knowledge about the research work being conducted by some of my peers as well as senior members of the society to address various burning issues such as improving different yield parameters, biotic and abiotic stress tolerance, symbiotic relationship development with friendly microbes and so on. Moreover, I was able to network with other PhD students and other scientists specifically by attending the conference dinner where the president of the society, Professor Sergey Shabala gave us an overview about the current status of ASPS in comparison to some major countries and some of the key responsibilities that ASPS members need to carry out to take the organization to an even higher level. Overall, attending this conference assisted me to become a better professional which would in turn help me to develop myself as a future leader in this field, and thereby disseminate my knowledge among the next generation of plant scientists who can then take up the baton to deal with global food security. ComBio2018 will mark the 60th anniversary of our society and is a great opportunity for the next generation of plant scientists to share their research and passion for plants with our community. As a society we provide travel grants to support our student members to attend ComBio. If you are a student attending ComBio or the supervisor of a student attending ComBio this year apply for a travel grant by COB June 15th 2018. Further details can be found at the ASPS ComBio travel grant web page. Welcome to this month’s newsletter! Check out the information below for a chance to work with the GPC, be involved with our New Breeding Technologies initiative, or to learn more about our upcoming workshop on “Enhancing Global Collaborations in Crop Science“. Want to work with the Global Plant Council?We’re hiring a full-time Communications Officer, who will be responsible for managing the GPC’s online presence, relationships with Member Organizations, Affiliates and sponsors, and for performing administrative tasks. If you think you could help the GPC to accomplish its mission to promote collaboration between plant and crop scientists from around the world, please see our job advertisement for more information, and contact Sarah Jose (sarah@globalplantcouncil.org) if you have any questions. Click here for the full job description. Application deadline: 29th JUNE! Our New Breeding Technologies Working Group are working on a number of exciting initiatives to help support researchers with both practical and legislative advice, as well as developing materials that explain the safety and utility of these technologies. If you are interested and/or knowledgeable in New Breeding Technologies, please sign up to our New Breeding Technologies mailing list to receive updates or requests for information from the New Breeding Technologies Working Group. The next GPC workshop, entitled “Enhancing Global Collaborations in Crop Science”, will be held in association with the ASA CSSA annual meeting in Baltimore, Maryland, USA, on 4th November. At this one-day event, attendees will hear from experts in both crop science research and policy, and discuss new ideas for enhancing collaboration and kickstart an initiative to address one of the world’s major food security challenges. The workshop will cost just $20, and places will be filled on a first-come, first-served basis. Strigolactones were only recently recognized as an important new class of plant hormone, and are now the subject of intensive research. The reviews and research in the latest special issue from Journal of Experimental Botany cover the rapid growth in our understanding of their diverse roles, as well as novel agricultural applications. Use of the powerful gene-editing tool CRISPR-Cas9 could help to breed cacao trees that exhibit desirable traits such as enhanced resistance to diseases. In the battle between plants and pathogens, molecules called small RNAs are coveted weapons used by both invaders and defenders. Researchers report how plants package and deliver the small RNAs, or sRNAs, they use to fight back against plant pathogens. Two independent studies show that mistletoe’s parasitic lifestyle has led the species to a rather surprising evolutionary loss. Mistletoe lacks key components of the cellular machinery other organisms depend upon to convert glucose into the energy-carrying molecule ATP. Winter wheat varieties can strongly support naturally occurring populations of beneficial fungi, which suppress the pathogenic take-all fungus. If you tilt a plant, it will alter its growth to bend back upwards, but how does it detect the inclination? Tiny gravity-detecting grains, known as statoliths, behave like a fluid, detecting even the slightest incline without being affecting by movements such as wind. 02–05 October 2018. Adelaide, Australia. 14–18 July 2018. Montreal, Quebec, Canada. Agricultural and Resource Economics Professor David Zilberman writes about the economics of plant science research, its achievements, and the funding it receives. You are receiving this email because you signed up to receive updates from the Global Plant Council. If you no longer wish to receive the monthly GPC E-Bulletin, or think you have received this email in error, please unsubscribe using the link provided.The Global Plant Council is a not-for-profit entity registered in Switzerland. 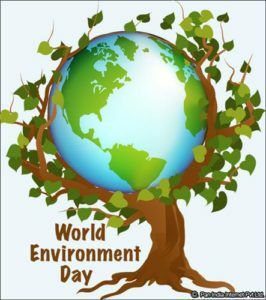 Hope you manage to reflect on your efforts this coming World Environment Day, Tuesday 5th June 2018. This years theme is Beat Plastic Pollution. I am honored to receive Plant Nutrition funding support to attend the 19th International Botanical Congress (IBC) in China. The conference was hold in Shenzhen during July 23rdto 29th, 2017, under the auspices of the International Union of Biological Sciences (IUBS), through the International Association of Botanical and Mycological Societies (IABMS) of the IUBS. Many world’s top experts present their exciting new findings in major plenary sessions and in a wide array of symposia. During the conference, I made one oral presentation named “Oxygen sensing in plant roots linked with ion channel operation: Revealing the roles of calcium transporters in response to hypoxia and salinity in Arabidopsis” in “Calcium transport and signaling” symposium on Friday, 28thJuly. After my presentation, many questions were asked about the possibility and potential role of TPC1 channel as oxygen sensor in plant. We also talked about the TPC1 function under combined hypoxia and salinity stress. One conference paper was published on line after this conference, and I also gained some new knowledge and skills through this conference. Finally, thanks for giving me this chance to the conference. I really appreciate that. It indeed improved my research ability and profiled my research project. Thanks again. As recipient of The Plant Nutrition Trust Award, I visited LSU AgCenter and its Sweet Potato Research Station in Chase, Manroe. It also coincided with the Annual International Meeting of America Society of Agronomy, America Society of Soil Science and Crop Science Society of America and I attended as a member at Tampa Convention Centre, Florida. LSU AgCenter, Sweet Potato Research Station conducts pioneering research on role of phosphorus on sweet potato root structure and architecture. This work compliments my PhD research project aimed at understanding root rhizosphere properties of sweet potato in low Phosphate soils. I also attended the meeting in Tampa purposely to meet and network with other international researchers who are involved in related studies to my PhD research project. I met many graduate students working on fields related to root rhizosphere as well as functions of microbial community that exists in the soil. This report highlight activities and contact made with other researchers on this trip. The LSU AgCenter Sweet Potato Research Station in Chase is devoted mainly to sweet potato research and development in the United States of America. Its mission is to produce and supply high quality seed stock to commercial sweet potato growers and conduct research in various disciplines to support the industry in the country. Some of the commercial sweet potato varieties used around the world, including Beauregard were developed from LSU AgCenter. Research into understanding the root system architecture and role of external soil nutrients on root development and storage root formation of sweet potato conducted at AgCenter is at very advanced stages. Variability in storage root yield of sweet potato is quite common in every country that grow sweet potato and remains a challenge. Understanding the root rhizosphere properties could potentially explain this variability and is the focus of my PhD research project. The pioneering work on sweet potato root system architecture at LSU AgCenter by Prof Villordon compliments research interest and was the main basis of many productive interaction during my visit. The AgCenter at Louisiana State University hosts a wide range of disciplines in agriculture. One is the plant pathology section. I had the opportunity to spend some time with Dr Chris Clark, a plant pathologist involved mostly in sweet potato pathogens. Dr Clark has many year of experience and has documented most sweet potato pathogens known in the USA and elsewhere. I also had useful conversations with Mrs Mary Hoy, a tissue culture specialist who manages supply of tissue cultured plantlets to the clean seed supply system. Dr Clark and I had conversations on the potential role of root exudates and its interactions with microbial community in the soil and its effect on soil borne pathogens of sweet potato. My study on measuring the root exudates and the microbial community could potentially contribute to understanding the effects of microbial agents on soil borne pathogens of sweet potato. The American Society of Agronomy, crop Science Society of America and Soil Science Society of America had their 2017 Annual International Meeting with the theme “Managing Global Resources for a Secure Future” in Tampa, Florida. I attended that meeting as recommended by Prof Arthur Villordon, who is my co supervisor, as it is a good opportunity to meet and network with scientist and resource people around the world. The discussion I had with Dr Villordon, who published widely on topics related to the role of phosphorus on sweet potato root system and architecture, indicated that my research on understanding the rhizosphere properties of sweet potato will certainly add value to knowledge gap needed to resolved persistent variability in storage root yield of sweet potato known to exist in many countries. This also gave the confidence that my work has relevance and a source of inspiration to complete well my remaining experiments and successfully complete my PhD study. My visit to LSU AgCenter also stimulated discussions on collaboration work as an extension to my PhD research project. Dr Villordon has offered to provide his expertise as best as he could from his experience elsewhere on projects similar to the proposed collaborations. I also had cross discipline discussions with Dr Chris Clark, a sweet potato disease specialist. He has an opinion that the root exudates and microbial community in the root rhizosphere could potentially suppress effects of soil borne pathogens of sweet potato. My next experiment has an object to unveil the microbiome in the root rhizosphere of sweet potato cultivars at different P rates. Hope a potential candidate microbial agent be identified from this work and hopefully that could further developed into a collaborative partnership. I had issues in establishing a good Phosphate response curve in my experimentation. I can now improve on that from tips I learned from Dr Villordon. He demonstrated that very contrasting P response can be achieved by establishing sweet potato from zero P medium to drain out the P reserves in the stem cutting and shoots before transplanting in trials pots. This will greatly assist in developing very contrasting response difference needed for my next experiment. Dr Villordon had a more updated collection of literature on sweet potato research in the world. He provided me the copy and that will greatly add value to improving my literature review section of my thesis. At the Annual International Meeting in Tampa, I made a good number of contacts with graduate researchers and specialist in areas related to my research work. We exchanged contact information and I look forward to make contact with them during the cause of my study and beyond. This productive trip would not have been possible without the funding support from Plant Nutrition Trust Award and I am grateful to Dr Peter Ryan and his team for this funding opportunity. I also acknowledge the support from UWA Graduate Research School. My supervisors Associate Prof. Megan Ryan and Prof. Arthur Villordon have not only suggested for me to take trip but have given me all the support needed to make this trip to the United States very successful. I thoroughly enjoyed it and was truly a fulfilling experience in my PhD journey. I had pleasant interactions with Dr Chris Clark and Mrs Mary Hoy at LSU AgCenter. They allowed me to appreciate sweet potato disease in relation my research focus and also gave me the opportunity to visit LSU Rural Life Museum. Finally, the hospitability I got from Ms Susan Karimiha at Baton Rouge and Prof Arthur and family at Manroe were second to none for which I am very thankful. I am honoured to be one of the recipients of The 2017 Plant Nutrition Trust Award, granted by Australian Society of Plant Scientists. Thanks to this generous support, I attended my very first International Plant Nutrition Colloquium (IPNC), combined with Boron and Manganese satellite meetings, held in Copenhagen, Denmark, from 19 to 24 August 2017. I am a third year PhD student from School of Agriculture and Food Sciences, The University of Queensland, Brisbane. My study area is on the absorption and translocation of foliar-applied nutrient fertilizers. The IPNC was the best conference that I have attended. Not only because the topic of the conference suited my study area, but also because it inspired through high quality of seminars and and poster presentations. This was especially true for the keynote presentations, which were given by world-leading scientists within the field. The main theme of the 18th IPNC was: “Plant Nutrition for Global Green Growth”. Indeed, the conference involved presentations on macronutrients such as nitrogen, phosphorus, and calcium, and micronutrients such as zinc, manganese, and boron. Furthermore, a range of plant species were considered, from arabidopsis and rapeseed to wheat and rice, with the focus of the research also being diverse, from nutrient transporters to next generation fertilisers. For example, I particularly enjoyed the keynote presentation given by Marta Vasconcelos titled “Impact of climate change on plant nutrition” which illustrated the effects of increasing atmospheric CO2 on crop growth and nutrient status. This presentation encouraged me to think of the study of plant nutrition at a more interdisciplinary level – not only should we study the relationship between plants and nutrients, but also we should consider the effects of other factors on plant nutrition such as the changing climate, the succession of nutrients in soil agriculture system, and the increasing human population as well as decreasing land area. I also enjoyed the presentation by Jianfeng Ma titled “Molecular mechanisms for distribution of mineral elements in plants” which was inspiring in that it clearly explained how nutrients are allocated and transported within plants, giving consideration to symptoms we can see using our naked eye to the underlying physiology and molecular mechanisms. I also benefited a lot from the keynote presentations by Peter Kopittke and Søren Husted which shared new analytical methods and techniques can be used in the field of plant nutrition with clear examples. On the 22nd August, I gave an oral presentation about my PhD research, entitled “Understanding how foliar-applied Zn fertilizer moves across the leaf surface in sunflower and soybean”. A particular focus of my presentation was describing a novel role for trichomes in the absorption of foliar-applied nutrients. My research drew the attention of Victoria Fernandez who is a well-known scientist in the field of foliar fertilisation and who also a keynote speaker at the IPNC. We had a lengthy discussion with interest, and she insightful suggestions. Most importantly, she expressed her interest to collaborate in the future, with this being an important achievement for me at this conference. There were also others who presented their work within the topic of foliar fertilisation. These presentations provided an overview of the current studies and showed that the mechanisms of foliar nutrients absorption and translocation are still not fully understood. It is also interesting that it was found that foliar fertilisation is often not helpful for plants that are already severely nutrient stressed, thus it is important to develop methods that can recognise plant nutrients deficiency at the early stages. The photo shows Victoria Fernandez (right side) and myself. I truly appreciated the generosity and support of the Plant Nutrition Trust Travel Awards. I have gained knowledge, expanded my horizons, and met face-to-face with researchers from all over the world in the field of plant nutrition. Moreover, it has firmed my determination to continue as a researcher within the field of plant nutrition!